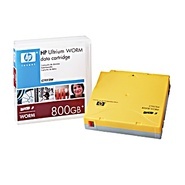 Hewlett Packard - C7973W HP LTO LTO3 LTO-3 Ultrium WORM (Write Once Read Many) 400 800GB Data Cartridge Tape. New Factory Sealed Product. Quantum - MR-L3MQN-02 QUANTUM - 400/800GB 680 METER LTO-3 ULTRIUM WORM TAPE CARTRIDGE (MR-L3MQN-02). NEW. MINIMUM ORDER 10 PCS. IN STOCK. SHIP SAME DAY. Sony - SDX3-100W SONY - AIT-3 230 METER 260GB WORM DATA CARTRIDGE (SDX3-100W). NEW. MINIMUM ORDER 3 PCS. IN STOCK. SHIP SAME DAY. Sony - SDX4200WWW SONY- AIT-4 8MM 200GB WORM (SDX4200WWW). NEW. MINIMUM ORDER 2 PCS. IN STOCK. SHIP SAME DAY.